We provide super fun surf lessons all year round, clases run at Torquay, Anglesea, Ocean Grove, Pt Addis & Urquharts Bluff. Fully qualified instructors, including lifeguards, first aid, WWC Cards. We provide state of the art 'G Boards' Soft malibu surfboards, body boards and a choice of steamers (full length wetsuits) or spring suits (short arms and legs) according to the season. Hoods and boots are also available for the cooler months. Our surfboards are very stable and buoyant and ideal for beginners. They are extremely safe with no hard surfaces or sharp fins - great for boosting your confidence! We have boards in different sizes ranging from 7'6" to 9' to match your size and ability. No prior knowledge is necessary, although you should be confident in the water and able to swim at least fifty metres without assistance. 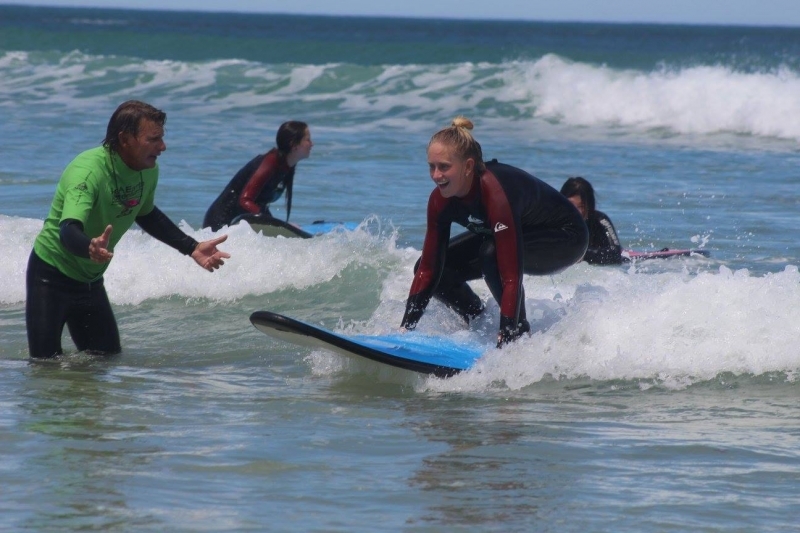 For the more advanced wanting to take their surfing to the next level why not have a private lesson with one of our senior coaches? Once you are consistently standing up in the white water we will introduce angled take-offs, bottom turns and trimming across the wave face. After that we'll teach you how to duck-dive your board, paddle with you out the back and put you in the right spot to catch plenty of waves. 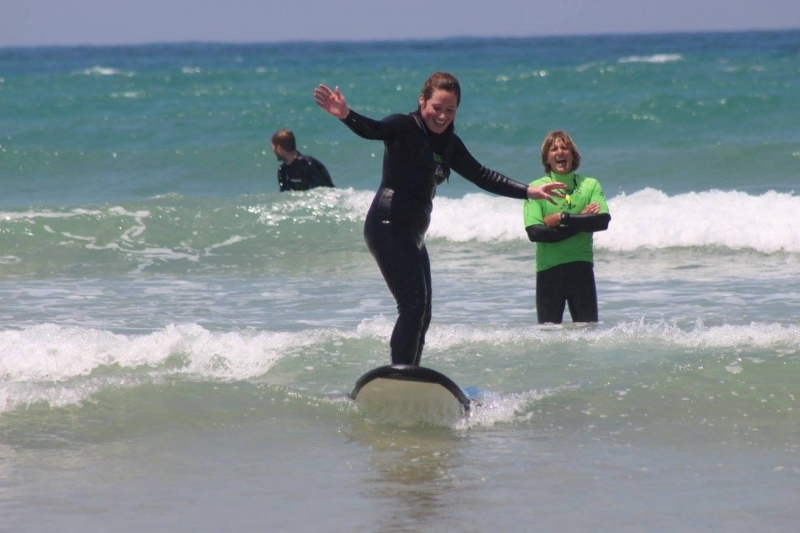 You can use your own board or one of our softboards, hybrid soft/hard board, fibreglass mini-mal, or even a short board, depending on your level of surfing and personal preference. All you need to provide is your bathers and a towel .. This will be the best fun you will have all year!!!! All multi-lesson packages must be pre-paid. Upgrades to multi-lesson packages are available after the first lesson only. 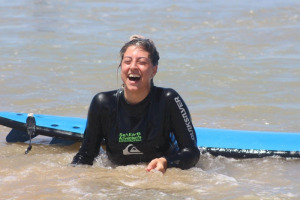 We also offer 3 hr lessons and multi venue Surfari style Adventures! 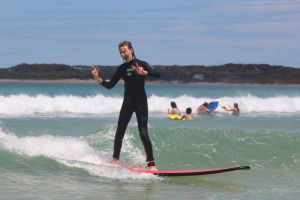 Classes run daily (booking dependant) at Torquay, Anglesea main beach and Ocean Grove during the summer school holidays and on weekends through to Easter. Session times are generally @ 10am every day with an 8am class on demand. We also offer afternoon sessions during the week at the Ocean Grove venue over summer. 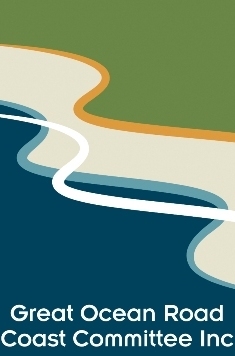 Groups of up to 5 people can also be run after 5pm at Torquay/Anglesea during summer. Lessons can also be run throughtout the day at Pt Addiis and Urquharts Bluff all year round. Bookings are essential for all venues, group rates are subject to a minimum number of 4 surfers. Meet at our trailer in the main surf beach car parks 15 miniutes before the scheduled start time with bathers and a towel. Meet at our trailer in Voss's Car Park. Voss's is the main surf beach car park overlooking the surf beach, at the opposite end of the beach to the Torquay Surf Lifesaving Club. Enter from the end of the Esplanade then turn right at the roundabout into the surf beach car park (make sure you don't turn left into the Pt. Danger car park). Meet at our trailer in the Anglesea Main Beach car park. We are usually parked near the main public toilet block on your left as you drive in. Meet at our trailer off Surf Beach Rd behind the Dunes Cafe at the Ocean Grove Surf Beach. This is also the location for the Ocean Grove Surf life saving club. Meet at our trailer near the toilet block/grass area in the bottom car park down the gravel road. The turn off can be a little hard to see with the Urquharts Bluff sign back from the main road. Please take care at the intersection as the cars may be fast approaching. GIFT VOUCHERS are also available which can be posted or emailed to print. Bookings are essential! Phone (03) 52612 241 Mobile 0408093247 or 0408709603 or click here to email.